A NASA photo of Olympus Mons, the tallest known mountain in the solar system, using wide-angle imagery from NASA’s Viking orbiters and the Mars Orbiter Camera. A vision of the school day of the future from Curtis Wong, principal researcher at Microsoft focusing on interaction, media, and visualization technologies. Wong has authored more than 45 patents pending in areas such as interactive television, media browsing, visualization, search, gaming and learning. 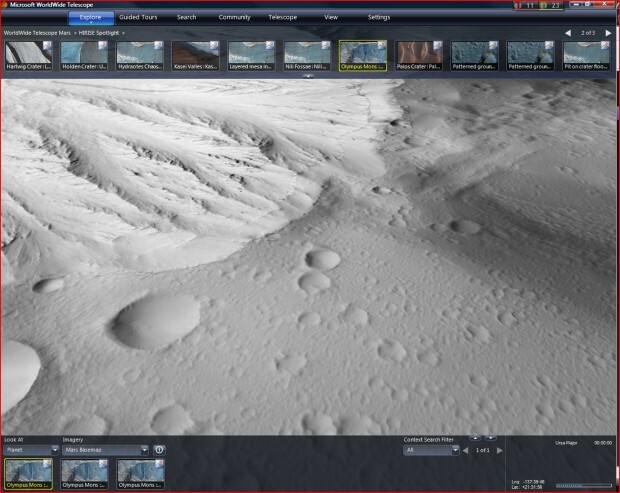 Wong worked on Project Tuva, which links the lectures of Nobel Prize winning Physicist Richard Feynman with interactive simulations and related content and the WorldWide Telescope, which essentially turns a computer into a telescope and features the largest collection of ground and space-based imagery that can be accessed online. Whenever I think about what a school of the future would be like, I remember the first time I visited the Vivarium Project Open School in Los Angeles over 20 years ago. It was conceived by Alan Kay and was exploring some new ideas around the classroom, the role of teachers and the potential impact of networked computers among other ideas in the ecosystem of learning. My first impression in talking to the students in the classroom was that they were responsible for their own exploration and they worked in teams. The teacher spoke with the whole class for a few minutes about the broader goals of the exploration, but most of his time was spent with each of the small teams of students that were working on researching and exploring problems in the context of the larger goals. The teacher was more of a coach and provided suggestions for areas to explore rather than giving answers to questions. Students were challenged and sought out resources to help themselves to understand and build the solutions that helped them make progress to understanding the bigger problems. To that end I can imagine the classroom of the future being organized loosely like the Vivarium Open School, but this time having much richer online resources that provide the full spectrum of instruction, exploration and assets and tools to allow students to research and construct their own learning experience and synthesize their learning, which can then be shared with others for further exploration by other students. The teacher provides some guidance on the questions to be asked but the students are responsible in small groups that use rich online resources that allow for the learning to extend far beyond the physical walls of the classroom and allows for leveraging the real benefits of actually being in a classroom: the interactions between students and with the teacher to facilitate the process of inquiry and self discovery. My ideas on the future school day are based on my experience. I've been creating educational resources that allowed for instructional learning coupled with self-directed exploration and constructive learning. I worked on interactive multimedia CD-ROMs for the Voyager Company, CD-Roms that integrated rich narrative with spatial and temporal contextual exploration in A Passion for Art" and "Leonardo da Vinci" from Corbis. I also worked on the broadband-enhanced PBS television program "Commanding Heights," which linked a streaming video television program with resources from interactive timelines and atlases, fully searchable and indexed transcripts of the program and interviews and glossaries. Commanding Heights allowed the teacher to deconstruct the TV show to quickly find elements for specific instruction while also enabling student exploration from those specific elements to understand the broader related context for the assignment. The program was recognized with a British Academy Award for Online learning in 2002 and validated the ideas around mixing instructional with self directed exploration for learning. A few years later, I led the effort to build the WorldWide Telescope, which was designed with this same information architecture allowing for expert-led guided tours about interested places in the universe (instructive learning) which could be paused at any time to allow for full interactive exploration within the richest simulation of the universe populated with the best imagery from ground and space based telescopes that are available today of they sky and deep space objects which are then coupled with deep information resources from different sources around the world. Students can create their own tours and share them with others. I also imagine short videos being accessible on any subject that is linked to deeper information resources and simulations that are available on the web which also allows rich note taking and sharing into the video itself such as in Project Tuva that I designed as an example for online video learning and note taking. Read more of MindShift's School Day of the Future series.